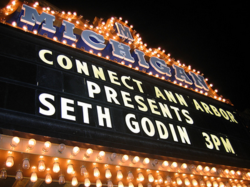 A short interview about the Dip and brands: Q&A: Seth Godin Says 'Know When To Bail'. Ernie really comes up with some winners here: Dips, Dead Ends, Joyrides, Lotteries, and Quests � iHack, therefore iBlog. However, I think he overstates the case when he says Quests (like Crick & Watson’s search for DNA) don’t have measurable progress. They do, but it is a matter of personal growth and accumulated wisdom, not the usual business metrics. Even though we may not reach what we thought we were aiming for, a worthy Quest enobles us and ends up benefiting humanity.